I don’t write a lot about vegetables. I’m clearly more of a sweets person. 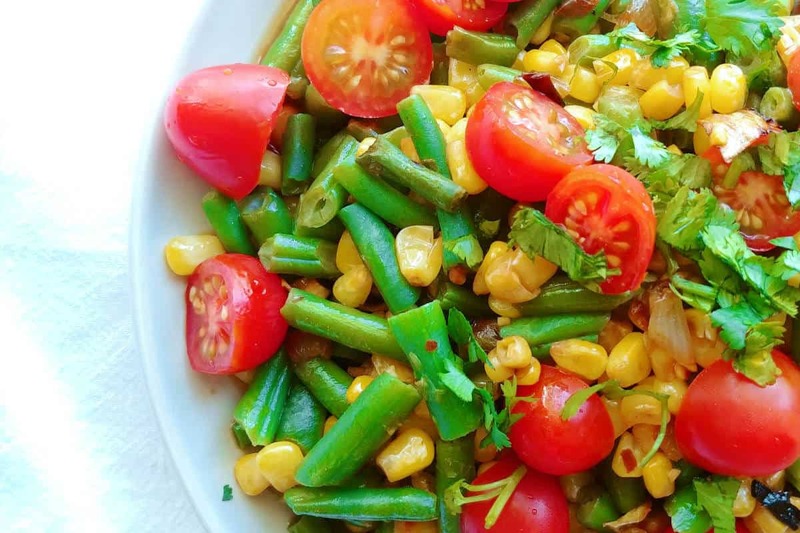 But this bright, flavorful Corn and Green Bean Salad with Lime is too good not to share with you. We love it. 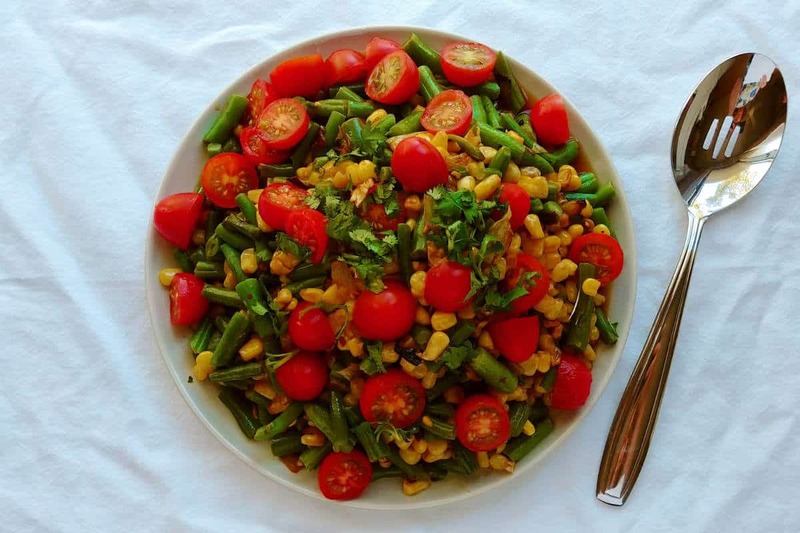 It’s a warm, all-vegetable salad, made mainly from frozen vegetables, cooked over medium- to medium-high heat in a cast-iron skillet. It has a bright lime-soy dressing drizzled over it, which really makes the dish. For Christmas I got a new cookbook, Deb Perelman’s Smitten Kitchen Every Day (affiliate link). We’ve liked all of the recipes I’ve tried from it. 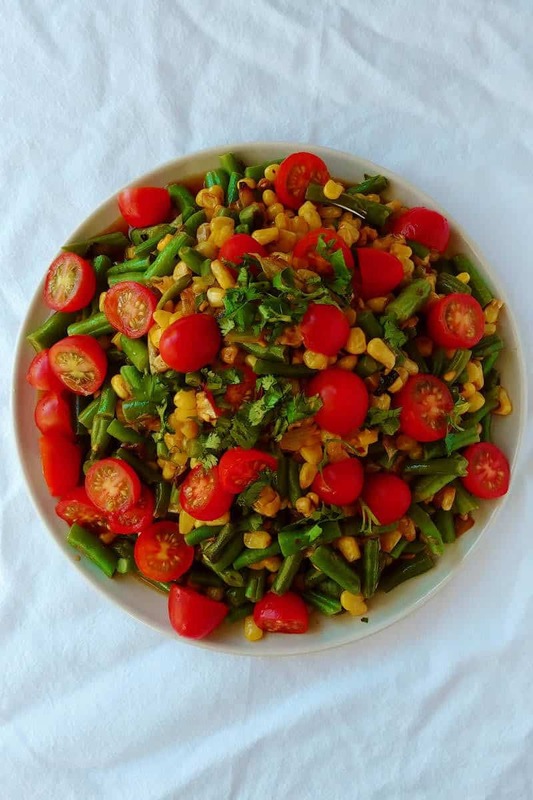 As I flipped through the salads, I saw a beautiful picture of a charred corn salad, flecked with bright green beans and tomatoes. It was February when I first saw the recipe. It involved charring cobs of corn over a gas stove, which I don’t have. Besides which, I don’t like cutting corn off of cobs; it always seems like a lot of effort. I had to try it, so I adapted it and made some changes to make it weeknight-friendly and delicious in all seasons. Instead of cobs of corn, I decided to use frozen kernels. No need to thaw them – they’ll cook long enough. The same goes for frozen cut green beans, which I also used. Deb’s salad has crispy shallots. I loved them. But the calories didn’t make it friendly for an everyday meal, so I had to cut them out. This also saved me from one more dirty dish. I replaced them with sauteed shallots or onions (both work) at the beginning of the dish, and cut out raw ones, which we simply don’t like in salads. I cut back a little on the dressing, as we always had some pooling in the bottom of our plates. The original called for fish sauce, which I don’t like so I always substitute in soy sauce for it. I skipped the basil as garnish. I liked it a lot, but whenever I buy basil, the remainder ends up going bad. Cilantro works fine, as does mint, as does skipping a garnish. I’ve served this salad with shrimp on the side pretty often – I cook the shrimp in the same skillet after giving it a quick rinse and scrub. But I also think it would also be good alongside a thin steak, or maybe a thin pork chop or chicken cutlet that you’ve given a good sear. You could also try serving it over thin rice noodles for a summer pasta salad vibe. In a pinch, it serves two as a main dish salad. Seven Years Ago: Hot Tamales! This warm, flavorful vegetable salad is brightened with a simple dressing of lime juice and soy sauce. A great vegetarian/vegan side dish or meal! Heat olive oil in a large (cast iron) skillet over medium heat. Add shallots and cook until browned, about 3-4 minutes. Add garlic and red pepper flakes, and stir to combine. Add corn. Cook for about 4 minutes, stirring occasionally but not often; you want to try to get them to brown. Stir in green beans. Cook for another 4-5 minutes, stirring occasionally. Meanwhile, combine brown sugar, soy sauce, and lime juice. Set aside. Dish salad into a serving plate or bowl. Top with diced tomatoes. Pour dressing over the vegetables. Serve garnished with basil or cilantro if desired. I always cook this using frozen vegetables without thawing them. 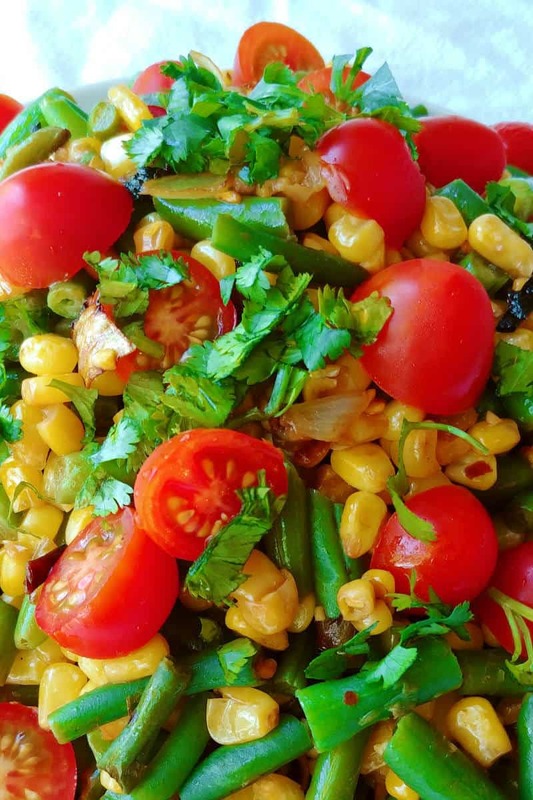 This recipe is adapted from the Charred Corn Salad in Smitten Kitchen Every Day. I've opted to use frozen instead of fresh vegetables to make it perfect for weeknight dinners, even in winter. 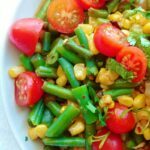 You can use fresh corn and green beans, if you'd prefer.